After losing to Floyd Mayweather last year at the MGM Grand Garden Arena in Las Vegas,Nevada, eight division world champion Manny Pacquiao talked to his millions of fans around the world that the reason why he lost was due to his shoulder injury. While many of his fans believed his explanation in toto, others think he was using his shoulder injury as an alibi for his less-impressive performance against Mayweather. To prove that his injury was serious, he submitted himself to a major surgery right after his loss to Mayweather to repair his torn shoulder rotator cuff. After months of post surgery rehab, Pacquiao said he has completely recovered from the surgery and told his fans that he is now ready to face Mayweather for the second time. Pacquiao assured fans that he is ready to give them the fight that they have been wanting to see as he challenged Mayweather to get out of retirement and face him in a rematch. For his part, Mayweather had downplayed Pacquiao's claimed injury as the reason for his loss saying Pacquiao should be man enough to accept his loss without putting the blame on his shoulder injury. After the fight Mayweather oiffered Pacquiao a rematch but later held on because Pacquiao did not immediately accept the loss. “Did I text Stephen A. Smith and say I will fight him again? Yeah, but I change my mind,” Mayweather says in an interview that was set then to be aired Showtime “At this particular time, no, because he’s a sore loser and he’s a coward… If you lost, accept the loss and say, ‘Mayweather, you were the better fighter,” Mayweather said after the fight. It may be recalled that Pacquiao was doing well against Mayweather during the first four rounds but was seen slowing down from fifth round onward. Pacquiao's trainer Freddie Roach has admitted that Pacquiao has complained about a recurring shoulder injury in the last few years but both of them may have thought that it was nothing serious until it manifested in the final days of training and midway to the Mayweather fight. 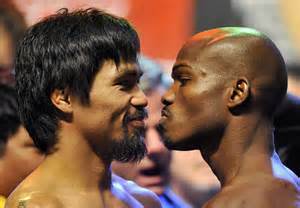 On April 9, Pacquiao should be able to show his fans that he will be facing Bradley with two good hands and if he can win convincingly he could either retire for good having proved to fans that he lost to Mayweather because of injury or call out Mayweather again for a rematch to settle the issue and put their long-running rivalry behind them.